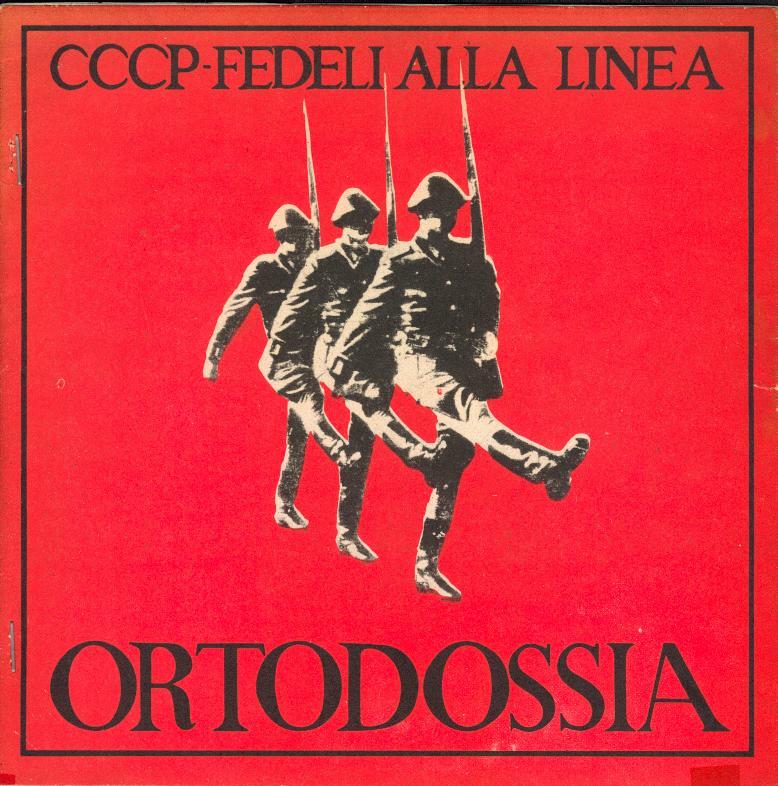 Although CCCP seem to have been quite popular in Italy with their later work, they remain still very unknown worldwide. The bands later work seems to be more on the electronic side of things and is not too interesting for a man like me, but their first record has one of the smash hits ever recorded! Yes, I’m talking about “Punk Islam” – downright mesmerizing, that track! The other 2 songs (3 on the 12″ version) are good stuff too, but to be honest, one could live without them after having heard “Punk Islam”. I never fully understood the bands concept. They seem to contemplate pretty much on stalinism and the aestethics of cmmunism. Still, this understanding doesn’t work in fully deciphering what it is the band tries to come across with. Whereas the italian 7″ versions booklet is not translated, the british 12″ version is, deficiently though. In 1985 (! ), the band writes lines like: “The destiny of Islamic culture in Western World has been the not acknoledgment and the refuse. Only what originates in the West can be matter of dignity, even if tolerance is never guaranteed.” Apart from this statement being total rubbish historically (what would the “western world” be without the “eastern” greek antique? 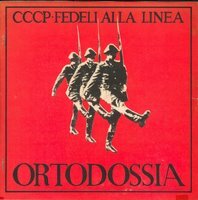 In the Renaissance, for example, a very popular dictum said that all light originates from the east; “ex oriente lux”), it’s rather interesting that the band CCCP subjectified the “west” and Islam already in form of a “clash” – this view would become very popular 15 years later in the notion of Samuel Huntingtons “Clash of civilisation”). But when the band takes a stand for Ghaddafi (spelled as “Gheddafi”), is this irony? However – maybe one day somebody with a better grasp of the italian language will illuminate us here and until then there’s still plenty of time for you to get ahold of both the 7″ and 12″ version of this record! The version of “Punk Islam” on the 12″ press is longer and a different mix. Can’t decide which is better. Both records are on red vinyl. Listen to the 7″ version of “Punk Islam”. Post a comment — Trackback URI RSS 2.0 feed for these comments This entry (permalink) was posted on Friday, March 10, 2006, at 10:25 by Admin. Filed in Post-Punk, Punk. nach all den inspirierenden Reviews bin ich jetzt natÃ¼rlich gehÃ¶rig scharf auf die dazugehÃ¶rige Musik – meinen Sie, es wÃ¤re mÃ¶glich, “Reanimated By Life #2” mal wieder online zu stellen? Den hab ich – im Ggs. zu Teil 1 – nÃ¤mlich ‘seinerzeit’ verpasst. tut mir leid, aber ich hab keinerlei dateien mehr zu RBL auf meinem computer; weiss also nicht, was da drauf war (ausser halt, dass es ein italien special gewesen ist). 19. RAF Punk viva la resistenza! 30. Crapping Dogs don’t cry, shoot! Somebody was asking me to rerelease the italian special of “reanimated by life” and also published the tracklist here to help me refiguring it. would first need webspace to upload them audio files and also check on what’s left of my selfmade mp3 files – accidentally erased over 20 gb of em last year. what a great, hypnotic song! it gets better every time one listens to it.